I made my first trip to Central America this past June, 2014. This opportunity was presented to me when I joined the Students for One Health (SOH) project, “One Health Nicaragua”. I participated in two amazing activities that allowed me to put into practice my greatest passions for veterinary medicine, One Health and wildlife conservation. Throughout this trip, I journeyed with a classmate, dear friend, and well-seasoned traveler, Karen Sorenson. When I arrived into Managua (the capital of Nicaragua), I admittedly experienced a short burst of culture shock as the sites of this new world flashed before me. Nothing could have prepared me for the incredible ride I was about to experience. Karen and I set out to spend one week in the southern most region of Nicaragua, to volunteer with the Nicaraguan, wildlife conservation NGO, ‘Paso Pacifíco’. Here, we assisted a local veterinarian and a park ranger with the ‘Jaguar Conservation Project’. Our mission was to provide temporary veterinary care to livestock attacked by jaguars, which up until January 2014, had been extirpated from Nicaragua due to deforestation. Working one-on-one with the vet, park ranger and farmers, I learned of the difficulty in problem solving issues concerning the wildlife and domestic animal interface, as well as the limitations to performing field medicine with very minimal resources. I also came to understand the influence of politics on conservation, and the importance of having a friend to remove ticks from unreachable places. Karen and I were also able to spend one evening with the local park rangers overseeing the ‘Sea Turtle Conservation Program’. Luckily, we witnessed an Oliver Ridley turtle haul out on the beach to lay her nest! 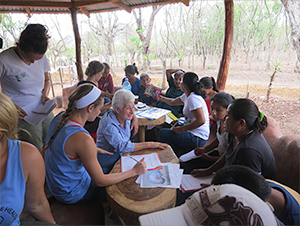 After our time spent in southern Nicaragua, we traveled northward to the rural, mountainous community of Sabana Grande. It was here that we teamed up with the rest of the One Health crew and the UC Davis, International Agricultural Development (IAD) students, in order to work with the local veterinary health promoters to address community identified issues related to animal health and the prolonged drought. By holding a series of workshops for community members and by participating in a community wide needs assessment, I learned a great deal about cattle nutrition, poultry medicine, and different perspectives on animal welfare. In preparation for and during this trip, I learned a great deal about international project development. Most importantly, I experienced the significance of education and communication to promote sustainable, preventative animal health. 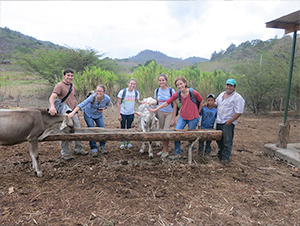 Over the course of two weeks in Sabana Grande, I also came to understand every-day life in Nicaragua by living with my host family. While the language barrier was a challenge, this did not prevent us from cooking meals together and watching Nicaraguan soap operas. Between bathing outside from a bucket, and needing a mosquito net over my bed every-night because of the open roof, an appreciation was reignited for how functional and content people can truly be as long as family is around. Karen and I chose to spend our last week in Nicaragua moving from hostel to hostel, traveling along the pacific coast. During this time, we exchanged stories with travelers from around the world, hiked through tropical rain-forests and up volcanoes, toured the oldest cathedral in Central America, and acquired some of the worst sunburns while surfing. 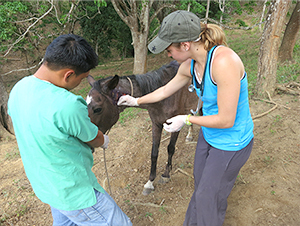 Altogether, each of these projects and my backpacking experience taught me a great deal about rural veterinary medicine and life in Nicaragua. In this country, it is undeniable that the health of the domestic animals, humans, the environment, and wildlife are truly interconnected. I cannot imagine having worked with a more sincere and passionate group of people as I did throughout Nicaragua. I would like to extend my deepest gratitude to the SVM International Externship Program for making this incredible experience possible.